Two years ago, Parise Rossignol was chucking up 3-pointers, pull-up jump shots and driving layups in two different intramural leagues at the University of Maine. 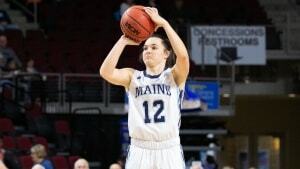 After two frustrating seasons with the UMaine women’s basketball team, during which she averaged four minutes per game, the Van Buren native decided to leave the program. At the time, she said she wasn’t enjoying the game as much as she once did. Fast-forward almost two years to Wednesday night, when Rossignol set the school record for 3-pointers in a game (8) in a 79-45 victory over UMass Lowell. She scored a career-high 32 points, five points more than the best game by her father, Matt Rossignol, during his UMaine career. WOMEN’S BASKETBALL: Jeff Walz and Louisville finally beat UConn. But what’s next? Rossignol, who rejoined the program for the 2017-18 season, never envisioned such a dramatic turnaround when she decided to come back. “It’s crazy to think how much has changed. I’m thankful for every opportunity to play another game,” said Rossignol, a secondary education graduate student. During her one-year hiatus, she remained in school and stayed in shape playing intramural ball in an all-women’s league and a co-ed league. But she missed her teammates and wearing the Black Bear uniform. “I followed the team real closely. I watched all the home games. I was definitely still invested in the program,” Rossignol said. Following that 2016-17 season, five UMaine players transferred, and assistant coach Amy Vachon, who was serving as the head coach after Richard Barron went on medical leave halfway through the season, was elevated to interim head coach. When Rossignol approached Vachon about getting a release so she could officially transfer to another school, Vachon invited her to return to the UMaine program. Rossignol gladly accepted the second chance. Rossignol had a memorable return last season, earning the America East Sixth Player of the Year award. She played in all 33 games with 13 starts, and averaged 5.4 points and 2.1 rebounds. She also posted 30 assists and 15 steals, and committed only 17 turnovers while averaging 21.3 minutes per game. Rossignol was chosen to the America East All-Tournament Team after averaging 13.3 points in the three wins that earned UMaine its first conference title and NCAA tournament berth since 2004. She shot 61.9 percent from the floor, 45.4 percent from the 3-point arc, went 9-for-9 on free throws and committed just one turnover. After 3-point specialist Julie Brosseau decided to transfer to Utah, Rossignol stepped into that role this season. Entering Saturday’s game at New Hampshire, Rossignol is the league’s top scorer in conference games, averaging 16.4 points. Teammate Blanca Millan is second at 16.3. In all games, Millan is the top scorer (17.6 ppg) and Rossignol is seventh (12.2 ppg). Overall, Rossignol is shooting 49.7 percent from the floor, and leads UMaine in 3-pointers (44) and 3-point percentage (.427). She also is averaging 4.3 rebounds, and has 29 assists and 16 steals in 20 games. “I’ve tried to step into the role the best I could,” Rossignol said. “I spent a lot of time here over the summer. I committed myself to doing as well as I can,” she said. Her father noticed a difference, saying Parise has never been in better shape. The Rossignols admitted her year away from basketball was difficult. “I went through a lot of different things personally,” Parise Rossignol said. “I lost my grandfather [Leo Dionne], and I had my appendix removed. “It was a tough year but it made what I have gone through the past two years even sweeter,” Parise Rossignol said. Her father had warned her previously that there would be repercussions if she left the program. “People would say you weren’t good enough to play at Maine and they would have the right to say it,” Matt Rossignol said. He echoed a similar sentiment when his daughter explored opportunities to play at a Division II or III school. “I’m her dad and I’m biased, but I felt she was good enough to play at Maine,” Matt Rossignol said. He was elated and appreciative when Vachon gave his daughter her second chance. “She has persevered, and I think she has shown she belongs,” Matt Rossignol said of Parise, who scored 2,589 points while playing for him at Van Buren High School, making her the state’s No. 2 all-time scorer. UMass Lowell coach Tom Garrick, who played against Matt Rossignol when he was at the University of Rhode Island, praised Parise Rossignol for her comeback. “Everybody gets knocked down and when you do, it’s about how you come back from it,” Garrick said. The 5-foot-8 Parise Rossignol, who realized that she would have to earn whatever playing time she got after rejoining the program, is pleased with how things have gone. “We won a championship [last season], and I was given an important role. And I’ve earned a starting role this year, and I’m on another successful team. It has been a lot of fun,” she said. Parise Rossignol’s dramatic improvement comes as no surprise to Millan. Junior forward Fanny Wadling has enjoyed watching Parise Rossignol blossom.